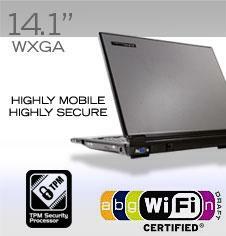 EUROCOM M548R EVEREST summarizes the perfect balance between mobility, security and performance. Integrated TPM technology (optional) combined with Fingerprint recognition device provides full data encryption and access security to your critical and sensitive information. Features dual-channel DDR2 memory, 800/533 MHz system bus, PCI Express* x16 graphics ports and PCI Express x1 I/O ports, Serial ATA, and Hi-Speed USB 2.0 connectivity.